As the digital economy continues to accelerate, policymakers around the world are grappling with how to prepare workers for the fourth industrial revolution. We don’t know what new technologies and scientific breakthroughs will remake the world in the next few decades, but one thing is certain: the economies of the future will require a workforce that can reason, analyse, collaborate, and quickly adapt to keep pace with innovation. So the best investment societies can make is in developing these skills in their future workforce – and this starts with investing early to develop the grey matter infrastructure of young minds. Investing in the early years not only transforms a child’s life; it can alter the trajectory of a nation’s growth and competitiveness. Thanks to a growing body of scientific evidence, we now understand better than ever before that investments in the early years – especially the first 1000 days of life during peak brain development – are critical to helping children achieve their full potential and escape the cycle of poverty. Yet millions of children today are being hardwired for failure. The cognitive, physical and socioemotional development of an estimated 43% of children under 5 in low- and middle-income countries are at risk of being permanently stunted by malnutrition, lack of early stimulation and learning, or exposure to violence and neglect (Black et al., 2016). The millions of children growing up in war zones and as refugees displaced by violence are particularly at risk because of the toxic stress they experience. If children don’t receive the right care and inputs during the critical window of brain development in their first 1000 days, they will never be able to fully benefit from later education, reducing their earning potential by as much as a quarter (Black et al., 2016). Disadvantaged and malnourished mothers are three times more likely to have malnourished infants (Victora et al., 2008), perpetuating a vicious cycle of intergenerational poverty. At a societal level, poor early development acts as a drag on economic growth, exacerbating inequalities that can sow the seeds of unrest. The World Bank Group estimates that per capita GDP in sub-Saharan Africa and South Asia would be 9–10% higher today if countries had eliminated chronic malnutrition when today’s workers were children. Globally, that figure is 7% (Galasso et al., 2017). The cost of inaction will only rise as future economies put an ever-higher premium on cognitive faculties. I worry that if this trend continues, the final common pathway for many countries may very well be fragility, conflict, violence, extremism and migration. An investment in grey matter development is really an investment in reducing insecurity in many parts of the world. It is clear that we can’t achieve our goals of ending extreme poverty and boosting shared prosperity unless we help every child reach his or her full potential. 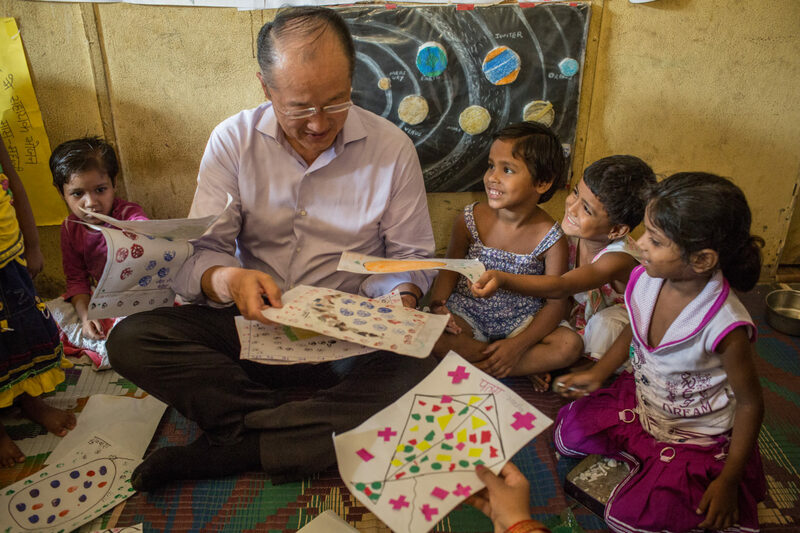 Therefore, we must act urgently to scale-up investments in young children’s physical, cognitive, linguistic, and social development – not just in low-income countries, but also in middle-income countries where there is significant need. Fortunately, we have strong evidence about what works and where to target investments for the greatest impact. There is growing research that the key to unlocking a child’s potential is through an integrated, multi-sectoral approach that promotes nurturing care, stimulates learning, and protects children from disease, violence and stress. 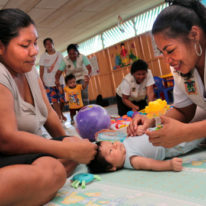 The most effective national strategies empower families with the time, resources and skills to provide nurturing care. They target the most vulnerable young families with high-impact intervention packages that streamline service delivery and maximise cost savings. 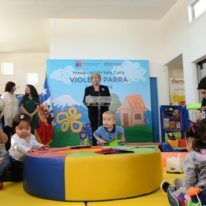 The World Bank Group, working with partners, has used the latest evidence to develop five such packages combining 25 services for families with young children. These packages require a ‘whole of government approach’ that coordinates delivery of services across sectors – health, nutrition, education, social protection, environmental conservation, water and sanitation. While investments in the first 1000 days make the greatest difference, access to pre-primary education ensures that development continues uninterrupted. Pre-primary education has been proven to be effective at preparing children with the skills to succeed in school, yet less than half of 3 to 6 year olds worldwide have access to pre-primary education. In sub-Saharan Africa, this number falls to 20% (UNESCO, online). Senegal shows the dramatic results that can be achieved through a holistic, coordinated early years strategy. Thanks to strong political leadership at the highest levels, Senegal integrated a service delivery system and coordinated with NGOs and a vast network of community volunteers. The country reduced its stunting rate from more than 30% in the late 1990s, to approximately 18–19% in 2014, one of the lowest rates in sub-Saharan Africa (World Health Organization, online). The best news is that the dramatic results experienced in Senegal can be achieved through low-cost interventions. Relatively modest early investment not only improves young children’s development, it enhances the effectiveness of other development interventions and spurs growth for decades. The World Bank Group estimates suggest that scaling-up efforts to reduce chronic malnutrition for 90% of the world population over the next decade would cost USD 7 billion per year (only USD 10 per child per year) (Shekar et al., 2016), and would have a rate of return of 15–24%, with an average benefit–cost ratio of 15 to 1 (Galasso et al., 2017). Other early childhood development investments also yield similar rates of return. Every dollar invested in quality preschool programmes, for example, will yield a return of USD 6–17 (Engle et al., 2011). "It is clear that we can’t achieve our goals of ending extreme poverty and boosting shared prosperity unless we help every child reach his or her full potential." The challenge now is to generate the political will to prioritise policy changes, coordination across sectors, and investments to ensure that every child has a chance to thrive. The World Bank Group has been working with governments to ensure that every country where we operate has a strong national strategy in place and the capacity to scale-up proven interventions. Policymakers increasingly recognise the importance of early childhood development, but we need more advocacy and, most importantly, more resources. 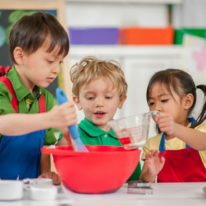 To keep the spotlight on the issue, the World Bank Group held a Human Capital Summit on Investing in the Early Years for Growth and Productivity in October 2016, where Ministers of Finance from nine countries pledged to improve nutrition, health, and education programmes for young children. Given the magnitude of the challenge, and the need to quickly scale-up solutions, we need strong partnerships. We have been encouraged by the growing coalition advocating for early childhood development and stepping in on the financing side. The Global Financing Facility for the Every Woman Every Child initiative, the Early Learning Partnership, End Violence Against Children, Scaling Up Nutrition and the Power of Nutrition are all important partnerships. 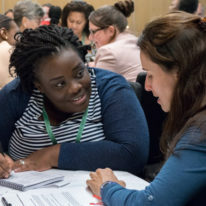 Building on these efforts, in April 2016 the World Bank and UNICEF launched the Early Childhood Development Action Network (ECDAN) to provide a platform for joint advocacy, learning, measurement, and accountability (see here). The strength of this network is in its diversity, with major stakeholders from the public and private sectors, civil society, academia, professional associations, foundations, donor agencies and local communities. Each stakeholder has a key role to play. Business leaders can serve as powerful advocates by convincing policymakers of the economic case for human development. Governments can provide integrated services at scale, while foundations are better placed to support innovative new ideas being tested in the field by NGOs or emerging through academic research. Private companies can drive innovation and use global partnerships to scale promising ideas across regions and around the world. Ensuring our children receive the skills and care to develop their full potential is everyone’s responsibility. Adequate investments in the early years lift economies and strengthen the fabric of our societies. Our challenge is to make sure everyone understands the strategic importance of early childhood development to build a more just and prosperous world, and ensure that no more children are left behind in a future that will no doubt surprise us all.